This protocol can be used to titer lentivirus preparations that confer antibiotic resistance. Determining the titer of your lentiviral preparation allows you to control the multiplicity of infection (MOI) in downstream studies. 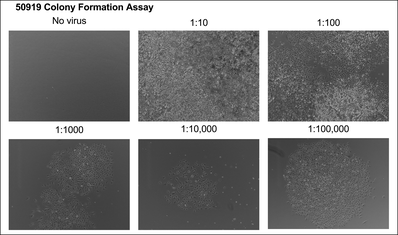 This protocol was developed for A549 cells but can be adapted to a variety of target cell lines and selection markers. Note this assay requires staining resistant colonies with crystal violet solution and, therefore, the cells cannot be used for later experiments. Day 2: Replace media with fresh media containing selection reagent. *Pro-Tip* Different brands and lots of FBS can promote or inhibit transfection. Test a variety of brands and lots of FBS to find one suitable with your protocols. FBS can be purchased already head inactivated or it can be inactivated in the lab by heating to 56℃ for 30 minutes. This protocol outlines the seeding of the cells at the same time as the viral transduction. For some cell lines, transduction is optimized if the cells are seeded the day before viral transduction. Note that in that case, polybrene should only be added at the time of viral transduction, and not during the cell seeding step. Before beginning a colony formation assay, the dose of antibiotic required to kill your target cell line needs to be empirically determined. Treat the target cells with a range of doses of antibiotic. Determine the minimum concentration required to kill all of the cells. Use this dose for the colony formation assay. Prepare a batch of DMEM complete containing 10 μg/mL polybrene by diluting 20 μL of 10 mg/mL polybrene into 20 mL media. Lentiviral titer can decrease during cycles of freeze-thaw. If you are freezing and aliquoting virus it is recommended that you titer from the frozen stock to account for any loss in titer associated with freeze-thaw. Note: the 1:10 dilution can usually be omitted because this dilution typically produces a lawn of cells, which cannot be accurately quantified. Seed 1,000 cells into each well of a 6-well dish. Prepare a batch of cells as follows: Dilute 7,000 cells into 9.45 mL of DMEM complete containing 10 μg/mL polybrene. Aliquot 1.35 mL of the cell suspension into each well of the 6-well dish directly on top of virus. Swirl gently to mix and place dish in incubator. *Pro-Tip* Different cells may be more sensitive to lentivirus or to polybrene, in which case this incubation step can be reduced to 8 h and the media can be replaced with DMEM complete. However, antibiotic-containing media should not be added until 48-72 h after transduction. Add 1.5 mL of DMEM complete containing the appropriate antibiotic. Incubate the cells for ~2 weeks. All of the cells in the untransduced (negative) control well should be killed and colonies should be visible. Every 3-4 days, gently aspirate the media and replace it with fresh DMEM complete containing the appropriate antibiotic. When the untransduced (negative control) cells have died and colonies are visible in the transduced wells, aspirate the media from the wells. Gently wash the cells with 1 mL of PBS and aspirate wash.
Filter 0.1% crystal violet solution through a 0.22 μm filter to remove any precipitates. Stain each well with 1 mL of 0.1% crystal violet for 10 min at room temperature. Wash cells 3x with 1 mL of PBS, being careful not to disturb the colonies. Count the colonies for at least 2 of the dilutions. *Pro-Tip* The higher dilution wells tend to provide more accurate titers as the likelihood of multiple integration events decreases as the dilution increases. 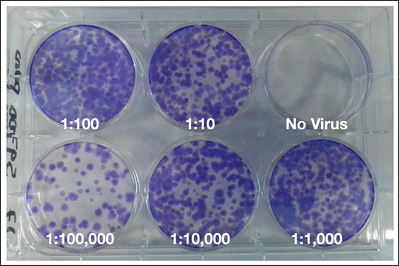 Figure 1: A549 cells were transduced with the indicated serial dilutions of the lentiviral vector pRosetta. The following day, cells were treated with puromycin. Colonies were allowed to grow in the presence of selective reagent for 12 days with media exchanges every 3-4 days. Colonies were then stained with 0.1% crystal violet and counted. Figure 2: A549 cells were transduced with the indicated serial dilutions of the lentiviral vector pHAGE EF1α dCas9-KRAB. The following day, cells were treated with puromycin. Colonies were allowed to grow in the presence of selective reagent for 12 days with media exchanges every 3-4 days. After 12 days of selection, no cells have survived in the untransduced well, while lawns of cells are present in the lower dilutions, and single colonies are visible in the higher dilutions.